Q: What are specialized high schools? A: Stuyvesant High School, Bronx Science and Brooklyn Tech are three public “specialized” high schools in NYC founded to offer an extremely rigorous math and science education to hard working and talented students who seek to pursue a career in science and engineering. The renowned and competitive schools have been free and open to all who obtain top scores on the SHSAT, a single objective multiple choice entrance exam on math and English proficiency which designed to assess the student’s ability to handle the coursework – which can be rigorous as advanced college math courses like Differential Equations and Multivariable Calculus given to ambitious students at schools like Stuyvesant. - Have produced 14 Nobel Prize winners combined since their inception, more than most countries. - today have 1/3 to more than half of their student body come from low-income households (based on number of students who receive free or subsidized lunch, a federal measure of poverty). - Have students who consistently outperform wealthier, private schools on academics - the average SAT score at Stuyvesant in 2018 was 1470 out of 1600, compared to 1430 at Dalton, a private school in Manhattan that costs $40,000 a year for tuition to attend. - 94%-99% Advanced Placement Exam participation rate. - Have near perfect graduation rates. Over the last few decades, as the demographics of the schools have become increasingly of Asian descent, the NYC DOE has sought to eliminate the SHSAT as admissions criteria to increase racial diversity at the specialized high schools. Q: What is the issue today? A: Over the past two decades (1994-now), black and Hispanic enrollment at these schools have continuously declined from a peak of >50% black and Hispanic under the SHSAT at schools like Brooklyn Technical High School to around 10% today. To address this, Mayor de Blasio proposes replacing the entrance exam by taking students in top 7% of every public middle school in NYC by school GPA and 7th grade state exam performance. 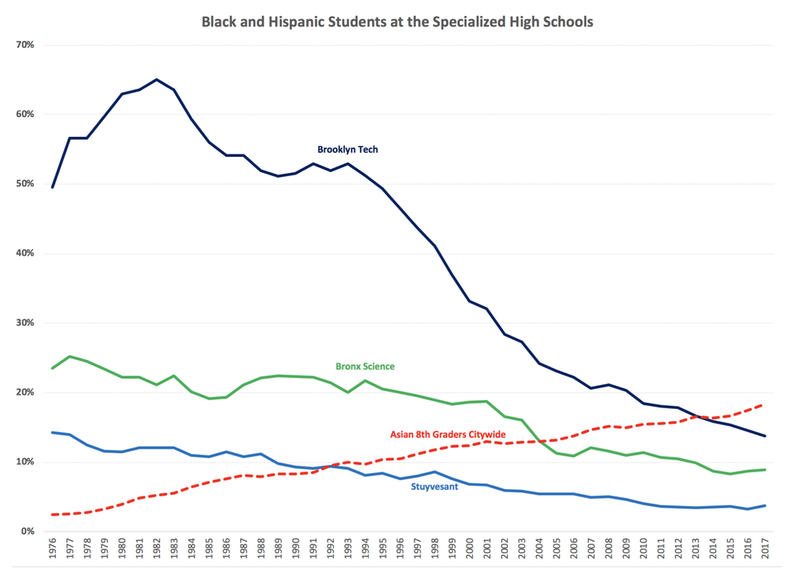 Q: Why did black and Hispanic representation at the specialized high schools decline? 1. In the early 1990s NYC DOE eliminated gifted/honors classes in poor, black and Hispanic neighborhoods. 2. Systemic grade inflation at majority black and Hispanic public middle schools under the NYC DOE’s watch to cover up their failure to provide a rigorous K-8 education to all. 3. Refusal to satisfy overwhelming demand from NYC parents who want their children to have a rigorous STEM HS education that prepares them for college and technical careers by constructing new large size (4000+ seats) specialized high schools and disparities in who applies for admission to a specialized high school. 4. Severe school overcrowding in Asian communities in areas like Queens and Brooklyn and policies like the District 2 preference create a situation where Asian students are forced out of their boroughs unwillingly yet locked out of schools like Eleanor Roosevelt, making the specialized schools their only viable option for attending a rigorous public high school.